I promise, I really do make food other than Mexican food. 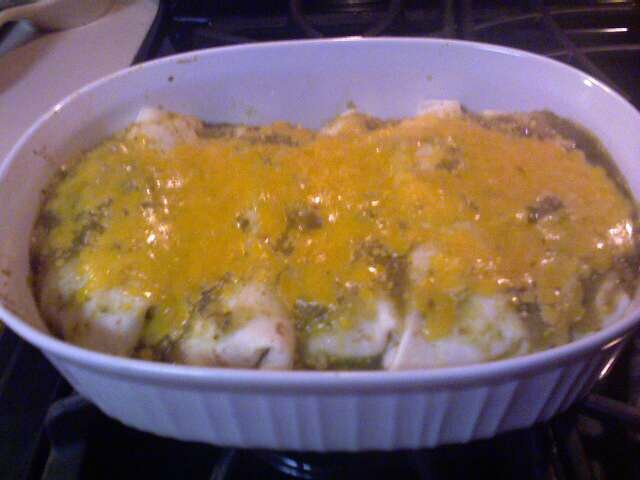 However... since I haven't been home and have had a few requests to post the recipe for the Chicken Enchiladas Verdes I made for Duff Man's Birthday (part 1), I figured I'd go ahead and post that recipe sooner rather than later. Your favorite cheese: cheddar, colby-jack, queso fresco, etc. Bring a pan to medium-high heat. Add a drizzle of olive oil (1 Tbsp?) to the pan and allow it to heat up for about a minute. Add the garlic and onion and saute until soft. Add the shredded chicken to the pan along with about a cup of salsa--just enough to ensure the the chicken is most and coated. Pour a couple of tablespoons of salsa into the bottom of a baking dish and shake it around until the bottom is coated. Dip a tortilla into the chicken/salsa mix (or into yet another dish with salsa in it) so that it's been dampened, then fill with 1/2 cup or so of the chicken/salsa mix. 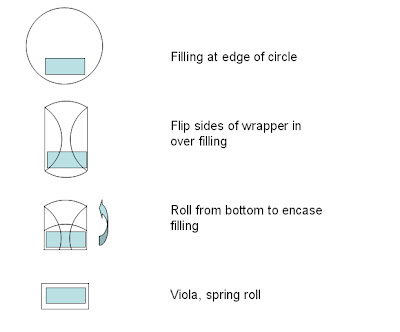 Fold the bottom up, the sides over, and then roll up. ('cause that's how I roll.) Place the enchilada seam side down in the baking dish and repeat until you've used up all of your filling. Normally 2 large chicken breasts will make 5 enchiladas total--2 for me and 3 for Duff Man. Top with any remaining salsa and sprinkle with cheese. Cover the top with foil. Bake for 20 minutes (with foil) and 15 minutes (without) until cheese is melted. Serve with sour cream and/or hot sauce. Enjoy! Once you've removed the papery skins and rinsed the tomatillos, coat them and the jalapeno with a layer of vegetable oil. I normally just pour some oil in my hand and rub them all down. [That's what she said.] I suppose you could be a little cleaner and use a brush to apply the oil--but where's the fun in that? Line the oily vegetables up onto the broiler pan and let them roast until the skins are blackened and charred--probably about 8-10 minutes on each side. Usually I just wait until I hear the tomatillos exploding from the built up steam, then I turn them over and move them around. Once the vegetables are done, take the pan out of the oven and set them aside. Toss the onion into your food processor and pulse a few times until it's diced. Cut off the top of the jalapeno (and remove the seeds if you'd like), then add the jalapeno, tomatillos, and cilantro to the food processor and pulse until it's as smooth or chunky as you like.